The Little House of Concrete Bookshelves: Martin Cruz Smith "Tatiana: An Arkady Renko Novel"
Martin Cruz Smith "Tatiana: An Arkady Renko Novel"
If there wasn’t a specific link on the official Martin Cruz Smith website I probably wouldn’t be referring to the revelation that one of my favourite authors has had Parkinson’s Disease and the diagnosis dates back to 1995. Under the circumstances, one can see why he kept it hidden from the reading public, but it was also a closely guarded secret as far as his publisher and editors were concerned. You would tend to assume, given the medical condition, that the writing might suffer, but in the period since the diagnosis he’s produced the Arkady Renko titles Havana Bay, Wolves Eat Dogs, Stalin's Ghost and Three Stations, all of which were quite sublime. 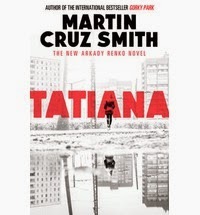 And, with Tatiana, he’s done it again, confirming a long-held belief that a new Martin Cruz Smith Arkady Renko novel needs to be approached as soon as I can get my hands on it. Better still, from my reading of the photographs here, there’s more on the way. It’s not as if there’s going to be a lack of material to work with. While Arkady Renko has survived the transition from the old Soviet Union to Vladimir Putin’s New Russia, the country’s oligarchy is as obsessed with maintaining secrecy and enforcing its wishes through whatever means it deems necessary as any of its predecessors have been. There are disturbingly familiar events at the beginning of Tatiana after reporter Tatiana Petrovna is alleged to have thrown herself from the sixth-floor window of the Moscow apartment she was trying to save from demolition by corrupt developers who want to convert the area into a shopping complex. Her death coincides with a power vacuum at the top of the criminal food chain after the execution-style murder of mob billionaire Grisha Grigorenko, a member of the Moscow Chamber of Commerce and patron of charities and the arts whose status stems from his interests in drugs, prostitution and stolen weaponry. While Grigorenko is buried with the trappings associated with a feudal lord, his death paves the way for a war of succession involving his son and heir apparent, and other Mafiosi with criminal empires of their own. Given the tendency for mobster funerals to attract persons of interest, Renko and his offsider attend Grigorenko’s funeral, where Arkady is sidetracked by a protest about Tatiana’s death. Her record of exposing corruption and cover-ups in government circles means there were any number of people who’d want to see her dead and the official verdict of suicide seems a little less than credible. There is a witness who heard her screaming as she fell. What caught Arkady’s attention was that a neighbour had heard her scream. Suicide usually took concentration. People who committed suicide counted pills, stared in fascination at their pooling blood, took the high dive in silence. They rarely screamed. Renko finds himself on the receiving end of some police brutality at the protest, but is persuaded to take a closer look at the investigation into Tatiana's death. The Cynical Reader might find this a little hard to accept, but a combination of Renko’s background and the fact that he’s carrying a bullet in his skull after a near-death experience in a past investigation means he’s not particularly concerned about the consequences of a little inquisitiveness. Add Arkady's neighbour and interim lover Anya Rudenko’s involvement in the demonstration, the cemetery’s refusal to inter Tatiana’s body which couldn't be located at any of the city's morgues and then was allegedly found and cremated before any investigation could begin and you’ve got a combination of circumstances that are almost guaranteed to pique a predilection towards inquisitiveness. Then there’s the notebook and the tapes. As Arkady starts sniffing around, assisted by his loyal alcoholic comrade, Sgt. Victor Orlov, the investigation leads from Moscow to the Baltic port of Kaliningrad, a geopolitical oddity populated by hundreds of thousands of ethnic Russians. The city was originally Konigsberg, part of eastern Prussia wedged between Poland and Lithuania taken by the Red Army in the dying days of World War II and held by the Soviet regime as a closed strategic region. Stalin forced the entire population to relocate and repopulated the city with Russians, but no one admits they are from Kaliningrad. They call themselves Koenigs instead. In the post-Soviet era Kaliningrad remains an important port, is the centre of the amber industry, boasts the highest crime rate in Russia and, interestingly, happened to be Grisha Grigorenko’s power base. Kaliningrad also gives us another body, that of cycling fanatic interpreter Joseph Bonnafos, whose death on a deserted Kaliningrad beach at the hands of a psychopathic butcher who stalks the beach in a van with a smiling plastic pig on its roof is described in the Prologue. He’s the author of the mysterious notebook, kept in a cryptic form of shorthand by a linguist who loved word games. And the dead interpreter’s notebook seems to link the other two deaths, with possible details of all sorts of dodgy dealings in the interactions between the government, criminal gangs and foreign powers. All that’s needed is someone who can crack the translator's personal and seemingly indecipherable code. In the end, of course, the code is cracked and the notebook delivers details of a clandestine meeting attended by Moscow’s leading criminals along with a series of revelations about corruption and greed. Having entered Tatiana’s abandoned apartment, Renko finds the archive of tapes that hold her spoken accounts of horrific crimes. Her accounts clash with the Kremlin's official versions of, among other events, the sinking of the Kursk nuclear submarine in 2000, the terrorist takeover of a Moscow theatre in 2002, the Beslan school massacre in 2004 and the Moscow metro bombing of 2010. Many of those events were covered by Anna Politkovskaya, the Russian journalist and human rights activist gunned down in the elevator of her Moscow apartment building in 2006. She provides the obvious template for Tatiana. Since her death was obvious payback for her aggressive reporting of events on the ground in Chechnya and exposés of corruption it was never going to be investigated too vigorously, and Moscow prosecutors ended up assigning blame to a former policeman sentenced in December 2012. Anna Politkovskaya didn’t have Renko on the case. Here, once he has access to the tapes, as he listens to Tatiana's recorded notes about scandals at home and abroad (Both sides have the same weapons … because our Soviet soldiers have traded their weapons for vodka. Here in Afghanistan, vodka is the great equalizer) the details are enough to have the reader lining up beside Renko in the quest for truth and justice without descending into overworked doom and gloom. There are other difficulties that cast themselves into the path as Renko sets out to get to the bottom of things, and the chief among them is his semi-official foster son, Zhenya. The moody seventeen-year-old chess prodigy is blackmailing Renko to give him permission to enlist in the Army. In return for that permission, Zhenya will have a go at cracking the code, assisted by another chess prodigy, an attractive young woman whose grandfather paints portraits of Stalin. While they're hunkered down with the notebook in Arkady's Moscow apartment, Renko has plenty on his hands as he continues to pursue his investigations in Kaliningrad. And that is where we start to get rather close to spoiler territory. Things work out in the end, and work out a deal better than the reader has any right to expect. But while Tatiana ends on a comparatively high note the reader just knows there’ll be another case, or another issue with Zhenya that’ll have Renko out in pursuit of a more civilised Russia. The brutal criminal billionaires at the top of the pecking order aren’t going away anytime soon, bureaucratic incompetence that has become endemic is never going to disappear, the lines between organised crime and big business are going to stay blurred, investigative journalism will still put lives at risk and a reluctance to investigate matters that might involve the rich and powerful will continue in official circles. On that basis, it’s just a matter of waiting to see what attracts Renko’s attention next time around. I, for one, hope it won’t be a long wait.